In 2005, we saw Christopher Nolan reboot Batman’s origins with a deep, intricate film, giving us a collective history on the character from orphaned-child to crime fighting hero. In 2008, we saw a surprisingly fantastic sequel, that is often considered to be one of the best superhero films ever made. 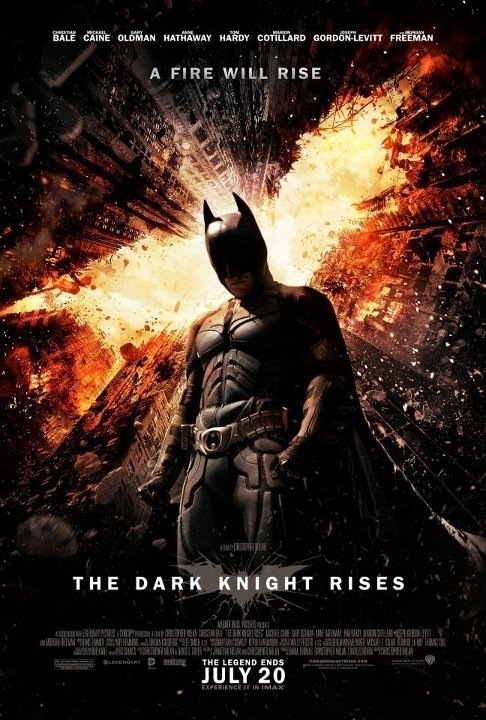 Now it’s 2012, and Nolan has openly concluded his dazzling trilogy with The Dark Knight Rises, an effective piece of entertainment, very kinetic, worthy, and intriguing. To keep the storyline as general as possible, it is eight years after the events of The Joker and Harvey Dent left Gotham City ostensibly irreversible in its damage. Now, crime in Gotham has decreased tremendously under the Dent Act, in memory of the town’s former governor, Harvey Dent, who is now their posthumous hero. Bruce Wayne (Christian Bale) has drifted into a reclusive soul, barring a bathrobe and slippers, walking with the assistance of a cane, and is so far off his game, he fails to even see the blunt signs of the conniving and devious Selina Kyle, known as Catwoman (Anne Hathaway). It isn’t long before another villain comes into play, named Bane (Tom Hardy), who tries to pry Gotham City out of its newly found peaceful nature and is determined to spread anarchy as far as the eye can see. He sports a metal mask, concealing his mouth, and delivers some of the most eerily satisfying monologues that are on-par with The Joker’s tomfoolery seen in The Dark Knight. I am also a big fan of his voice that, unlike Bale’s Batman voice (which is pleasantly shoved to the side in this film), is a more authentic replication of a comic book character’s voice. It sounds robotic and heartless, as it should, and it doesn’t sound fake or put-on, like Bale’s. Inevitably, I feel Hardy won’t get the recognition he deserves for playing Bane, as I mentioned prior in my review of The Dark Knight, no matter what Nolan will choose to do the series or what route to take, it will always be remembered by the iconic performance of the late Heath Ledger. The film occasionally comments on many issues of the world, such as violent terrorism when showcasing the encounters of Bane and his team of goons, the financial blows to the country, including a fantastic hold-up scene near the beginning of the picture, and a view on society that can seen as a commentary relevant to today’s uncertain times. The Dark Knight Rises, unfortunately, starts off on the wrong foot, bombarding us with new faces, developing them in a hazy manner. We get introductions to many characters, including Joseph Gordon-Levitt’s John Blake, a rookie cop, and while the film knows it wants to incorporate two sneaky villains, it has a hard time giving both of them valuable screentime and substance. It seems to sometimes become lost and crushed under the weight of its monologues, which are occasionally overlong and over-written. For a film about the caped-crusader himself, it should also be noted that he makes very few appearances in the film, and to me, that’s not a bad thing. Nolan ends his trilogy in a much more coherent way, wiser than the conclusions to other past sagas, such as Sam Raimi’s Spider-Man 3. While that picture knew how to accomplish things visually, it struggled to balance its three villains, its hero’s alter-ego, and the pending love interest that continued to burden its hero, Peter Parker. The Nolan Brothers, Chris and John, who penned the screenplay to this film, wisely choose to center much of the action on the heroes out of costume, giving a more real approach to the undefined definition of a “superhero film.” We see Batman as his alter ego, Bruce Wayne for most of the film, showing that he is a hero regardless of the gear he sports. One thing we neglect to learn are Bane’s motives behind his devilish attacks, one of which is the explosion of a football stadium, which is captivating and stylish, much like the rest of the film. Never do we dive into his backstory, or Catwoman’s, as more than just “they do it because they’re evil.” It’s unfortunate after watching The Joker, who instantaneously presented himself as a fleshed-out villain. Not to mention, Hans Zimmer’s score, which was put to great use in the original Dark Knight, is bombastic and sometimes very distracting, sort of becoming hard on the ears after a while. This is coming from someone who has never been too caught up in the story of Batman’s origins and, likely, I’m one of the few with this complaint. If you can simply immerse yourself into this epic, than this will probably not bother you in the slightest. The Dark Knight Rises sometimes meanders and after 164 minutes of relentless action and monologues, one will definitely need a break and some time to take in everything they were just handed. While the film begins in a shaky manner, it pulls itself together quickly, delivering a visual cacophony of beauty and style, especially in its last twenty-five minutes that are profound and invigorating. Considering this film had to live up to nearly impossible hype and still manages to come out standing on two feet, it is still a success in my eyes. NOTE: The twist ending put a big smile on my face too, seeing as originally, I was very upset by one of Nolan’s origin decisions. Starring: Christian Bale, Michael Caine, Gary Oldman, Anne Hathaway, Tom Hardy, Marion Cotillard, Joseph Gordon-Levitt, and Morgan Freeman. Directed by: Christopher Nolan.